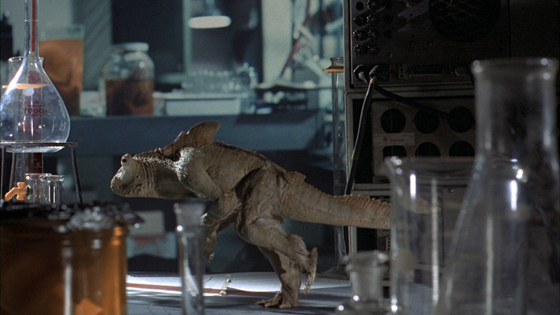 Little Lab of Horrors – Piranha (1978) | "This Film Should Be Played Loud"
I’m a big, big fan of Joe Dante. He has a unique stylistic personality, one which combines cartoony humour, ghoulish shocks and B-movie affection effortlessly. He’s always climbing higher and higher up my list of favourite directors with every passing year. Piranha is the first movie Joe Dante directed by himself. Having previously co-directed Rock ‘n Roll High School for Roger Corman, the filmmaking legend enlisted Dante again for this project. Considering Piranha was designed as a cheap cash-in on the success of Jaws (it was released at the same time as Jaws 2) it has a lot of inspired little touches which make it memorable in it’s own right. Not only was it written by John Sayles (the first of two movies he wrote for Dante) it also features a terrific early score from Pino Donaggio. The scene in question pops up about ten minutes into the movie. An insurance investigator (Heather Menzies) goes searching for two missing teens and, with the help of a stubborn backwoods booze hound (Bradford Dillman), stumbles upon a decrepit old military compound. The two venture inside and find an old laboratory full of abandoned experiments. While this little scene is one of many wonderful flourishes peppered throughout the film, it’s probably my favourite. The thing I like most about it is how it hints at a world beyond the film we’re watching and how it celebrates the grotesque. While our main characters snoop about the lab looking at the ugly little creatures in pickle jars, presumably unsuccessful test-run’s for the deadly piranhas, Dante lets his audience in on a little secret – there’s another little creature roaming free, sneaking about avoiding detection. It’s a simple, crudely animated little stop-motion puppet, part fish, part lizard, but it has character. The way it observes Dillman and Menzies, letting out little groans really makes you feel sympathy for the little guy. It’s also worth noting that the stop-motion was completed by Phil Tippett who would go on to be an award winning titan of special effects, and most notably worked on Jurassic Park. I’m sure there’s a story to be told about this little monster, whatever he (or she) is. Dante apparently wanted it to re-appear in a later scene and even toyed with the idea that it would mutate into a large monster and start terrorising people in a cheeky ending joke but as it stands the creature doesn’t show up beyond it’s one appearance. Regardless, the moment doesn’t feel out of place, it belongs. This is all down to Dante, his movies have always welcomed horrible little creatures great and small and offered them a haven to be showcased and celebrated. That’s why this scene means so much to me: out of all the monsters Joe Dante has brought to life, this is his first. This entry was posted in You've got a killer scene there, man! and tagged joe dante, piranha, Scenes. Bookmark the permalink.